Getting Paid to Travel? Meet our Ultimate NZ Tour Leader! Welcoming Our Ultimate NZ Tour Leader! Getting paid to travel the world? Now that’s something that sounds too good to be true. As you can imagine, we attract some pretty interesting people for our Ultimate NZ tour leader roles. 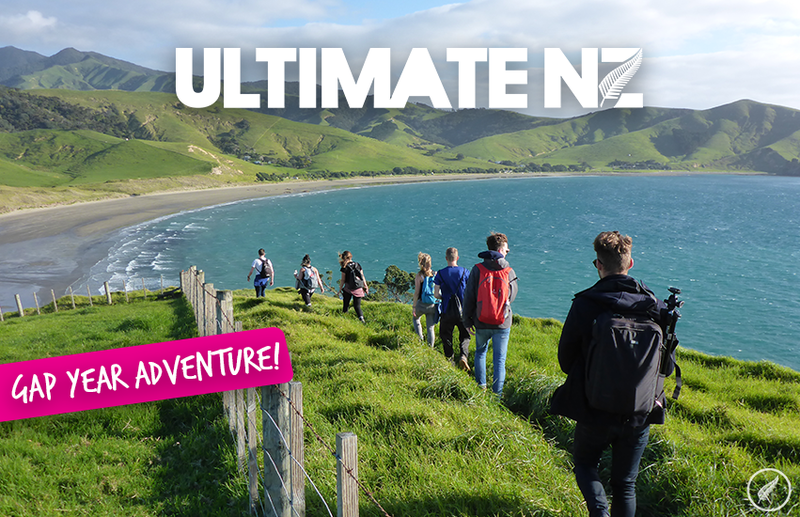 So we all got very excited after finding out we had a new Ultimate NZ tour leader joining us. Our tour leaders tend to be very eccentric, fun and outgoing people – so we are always eager to get to know them! Hey Kaitlyn! How did you catch the travel bug? I went to Japan for a student exchange program when I was 14! (Thank you mom!) I was an extremely picky eater and this opened up a whole new world of cuisine and culture to me. My mom said I was a different person when I got back. One of the best parts of traveling is trying all the local foods! What made you fall in love with NZ? Nature, nature, nature! You can’t look at one ugly thing here because it’s just too beautiful. They have prime hikes and kiwis are always keen for adventure. Also the super friendly people, crazy activities, and perfect beaches aren’t too shabby either. What advice would you give to a first-time traveller? Kaitlyn also has a popular travel based Instagram account (@fearlesstravelers) where she posts amazing pictures from her travels. As well as being an avid traveller, Kaitlyn also has a keen eye for photography. As our new Ultimate NZ tour leader, she has been posting some amazing shots of New Zealand recently. Her Instagram is well worth checking out! Tell us about your Instagram and how travel influences it? Well it’s all travel related. My whole life is travel related so everything I post is about my adventures on the road. I traveled around Europe solo for a year and a half and am now working & traveling in NZ. Now my insta is consumed by the beauty of NZ, which I don’t think anyone is complaining about! What is not to love about it? Being an Ultimate NZ tour leader, I get to go around one of the most beautiful countries in the world and inspire the tour members to see and do more than they could have imagined. NZ is filled with adventure, beauty and the nicest people. I couldn’t imagine working for a better company. Everyone is so supportive and super fun. It truly shows in the tours and I always have fun days at work because of it. So there we have it – another awesome tour guide joining the Ultimate family! Kaitlyn has just finished her second Ultimate New Zealand tour, and we have heard some stellar feedback from our travellers about her as a tour guide. Welcome to the team Kaitlyn, and keep up the great work! https://www.ultimate.travel/wp-content/uploads/2018/02/NZ-Tour-Leader-Blog-Cover.png 315 851 Bernie Augstein https://www.ultimate.travel/wp-content/uploads/2015/01/logo-300x94.png Bernie Augstein2018-02-05 11:50:232018-05-01 18:24:39Getting Paid to Travel? Meet our Ultimate NZ Tour Leader!